I made this card for this week's Fall to Layout from the Clean & Simple Stamping blog. You can view the original sketch here. I modified the sketch a bit, using my Top Note die instead of the large scallops at the bottom of the main panel. 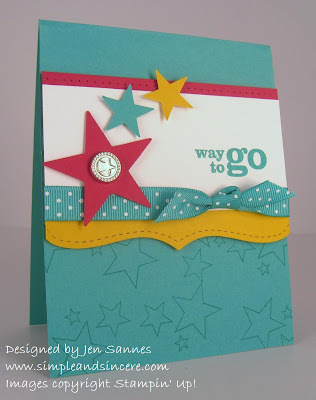 I really like the way this turned out - it's bright, cheerful and fun! Things have a been a little crazy at our house this week. Both of my kiddos are sick with colds, so today has been a day of rest (at least for the kids). I really hope they are feeling better tomorrow! This is so CUTE!! LOVE the colors and popped up stars!! What a cool card! I love the top note as a border, must try that!